Every year, Women's Support Services, which provides shelter, counseling and other assistance to victims of domestic violence throughout northwest Connecticut, puts on a huge benefit called Trade Secrets, a 2-day gardening event. The first day is a trade show, with rare plants and antiques, and the second day offers tours of some of the unusual and beautiful gardens. Weatherstone was built in 1765 (and rebuilt 7 years ago after a catastrophic fire) -- the grounds include formal and cutting gardens, a greenhouse, tennis courts, ponds, streams and waterfalls, acres and acres of horse paddocks, and various outbuildings. I've driven and jogged by it dozens of times, but never been on the rounds before - I had no idea how beautiful it is. 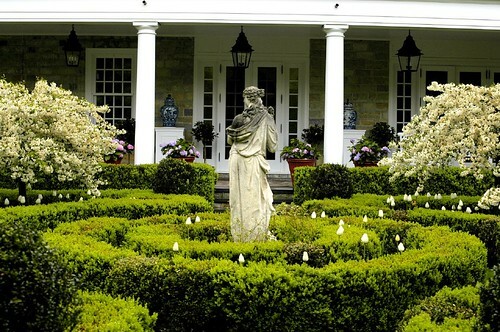 Carolyne Roehm lives there - she was a fashion designer and now writes books about gardens, design, and entertaining, filled with photos of Weatherstone. The mission of Women's Support Services is to create a community free of domestic violence and abuse through intervention, prevention, and education. We offer free, confidential, client-centered services focused on safety, support, advocacy, and community outreach. Women’s Support Services (WSS) is a non-profit organization that has provided critical services to victims of domestic violence and abuse in the towns of Salisbury, Canaan, Falls Village, Cornwall, Kent, Sharon and nearby New York and Massachusetts since 1981. Our services include: a 24-hour crisis hotline; emergency shelter; individual support counseling for adults & youths; legal, medical and social service advocacy; support groups; and community education and prevention programs. All WSS services are free of charge and totally confidential. For more information about WSS call 860-364-1080.
beautiful garden for a lovely cause, a knowckout combination. keep on rockin'! Oh I'd enjoy going to this; a great cause too. A really excellent post, Jenny. Thank you for it, it is highly informative. It was just a quick look-in, & will go look at pics later, with more time. Will mail too, à propos. Work first! !